OK folks - have at it! We're going to get Apple to build their damn computers and things in this country instead of in other countries. Both nominating Trump and not nominating Trump are horrible outcomes for the GOP and that makes the conventional wisdom especially volatile. It is appears that Trump is the only candidate who has the capacity to think outside the box. In this day and age, that is not all bad. Senator Graham, from North Carolina, should be drummed out of the Republican party for not backing the Party's choice. The same for Rick Perry. Speaker Ryan is also a piece of work. With leaders like those, Hillary will have an easy time getting into the White House. In today's issue of The Greenhills Journal, Kenny Burck has a letter to the editor supporting Donald Trump that concludes with "I am voting for the most conservative Republican candidate." Although that has been a standard Republican strategery for quite some time (and it's technically true since D.J. Trump is the only candidate) is it REALLY true that Mr. Trump is the most conservative Republican candidate? Please review the following documents. 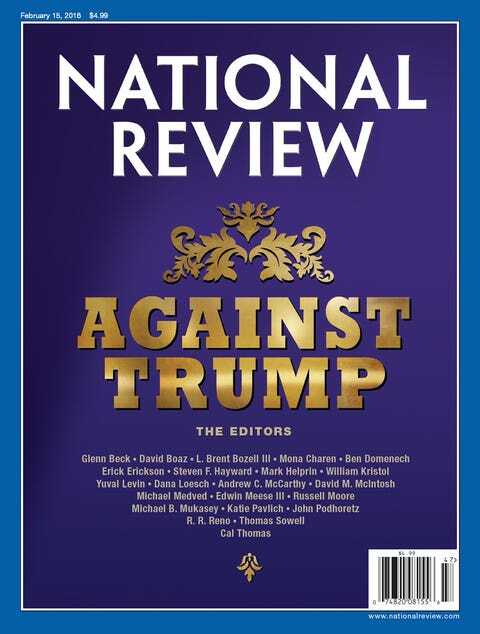 And please - let us not forget this issue of The National Review - read it and weep. Mr. Burck has also voted for Democrats in the past as well. Defining Trump as a Conservative is hilarious. trump is more like Teddy Roosevelt than a conservative. Trump IS a progressive, shows bits and pieces of war mongering, and has displayed some isolationism language which does NOT make Trump a conservative. Still better than the other candidate who has lied, been preyed on by her own spouse, failed to defend her own consulate employees, been in shady real estate deals, deleted 33,000 emails for "who knows what" reason, and not to mention does not like to talk to the media. By the way, it's been nearly 300 days since she this "other" candidate has had a press conference. It is unreal why anyone would vote for someone with the track record that Hillary has. It's an American tragedy that someone like her could become the President. The lady who passed out on Sunday was not Hillary; it was body double. Hillary was actually the starting offensive guard for the New York Jets which explains why my beloved Bengals only had 1 sack on Sunday. She will not become President, but she may be dealt at the trading deadline for a play off contender. Mr. Trump is in town this evening, 7:30 at the US Bank Arena. Is anyone we know going?